June 2006... Time for bigger stoppers! I had great fun in the car whilst out on track, but the brakes having been upgraded to Peugeot 306 GTi-6 discs, were still not upto the job! Very quickly whilst blatting around the track at speed, brake fade would creep in, meaning that I'd have to ease off the go-pedal! After a quick chat to Garreth at G.S Motorsport, I ordered some stoppers that shouldn't suffer brake fade... in fact I was more worried about the car over-braking! 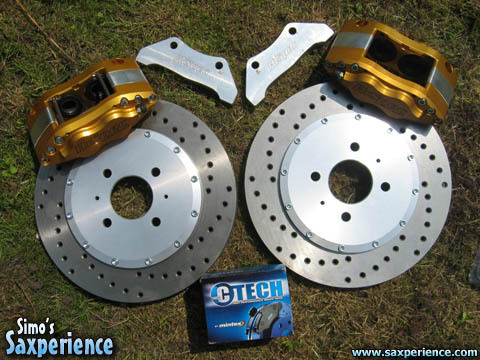 After waiting for a week or two my new brakes arrived... a pair of Hi-Spec 325mm 2-piece discs with gold 4-pot calipers! 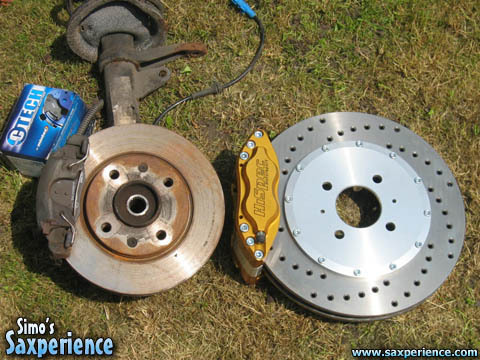 In comparison to the standard VTS discs/calipers these new brakes were absolute monsters! I'd been invited back to Bruntingthorpe for a hospitality day, which I intended to make good use of! The drivers side driveshaft, which snapped whilst last out on track had been replaced with a new item and so I sent the car off to DP Motorsport in Warrington for them to give the car a track health fitness check! Whilst the car was in at DP Motorsport they sent the car to RC Developments, where the hand made exhaust was repaired... luckily Clive still had some of the custom baffles used to make it originally! That should stop the annoying exhaust blow tht I'd been putting up with for years! DP Motorsport gave the car a clean bill of health except for a cracked rear brake disc... that could have been nasty if it had shattered whilst out on the track, or the road for that matter! I fitted a new set of rear discs to make sure everything was in tip-top condition. The brake hoses supplied with the Hi-Spec brake kit were not a very good fit. The hoses were too long and the banjo-style fitting meant that the brake hoses were pointing directly into the path of the rotaing wheel! 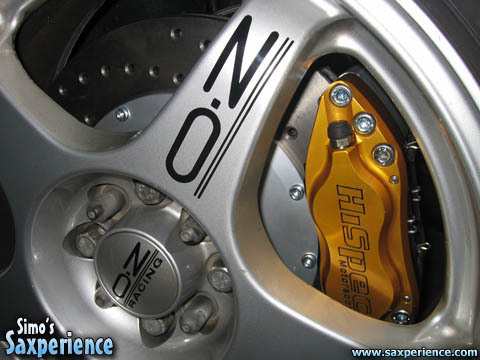 I wasn't happy about this and it appears to be a problem many Saxo owners have had when buying Hi-Spec brake kits! 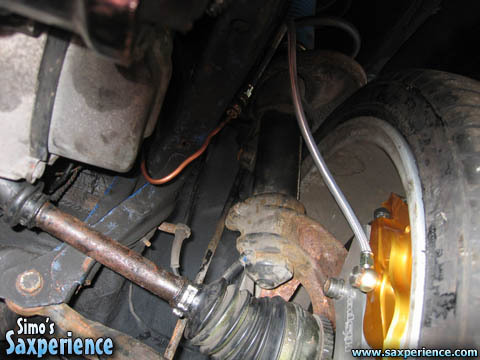 I modified the original brake pipe brackets and positioned the brake hoses so that they were as far away from the wheel and the suspension strut as possible. Some new hoses with a straight male thread will need to be bought and fitted very soon though!